SYRA Arts is pleased to present an exhibition for the San Fransisco based Iranian artist Yari Ostovany. Born in Iran in 1962, Yari Ostovany moved to the United States at the age of 16 and pursued his studies in Art first at the University of Nevada - Reno and then at the San Francisco Art Institute where he received his MFA in 1995. He was based in Cologne from 2000-2004, and since 2011 has been residing in the San Francisco Bay Area. Ostovany has worked, taught, traveled and exhibited extensively in the United States and internationally, and is the recipient of the Sierra Arts Endowment Grant, Craig Sheppard Memorial Grant and Sierra Nevada Arts, Foundation Grant. Recent exhibitions include Vorres Gallery in San Francisco, Haleh Gallery in Berg am Starnberger See, Germany, Thomas & Paul Gallery in London, UK and Aria Gallery in Tehran, Iran. 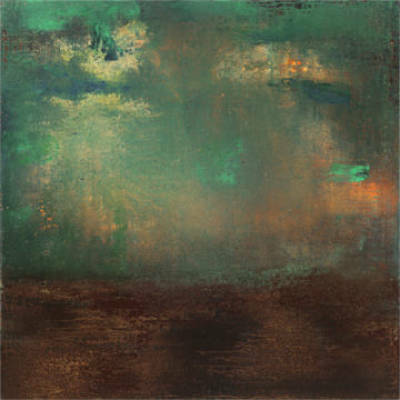 His work is in the permanent collections of institutions including the New Britain Museum of American Art in New Britain, Connecticut, Pasargad Bank Museum in Tehran, Iran, Permanent Collection of the University of Nevada - Reno Art Department and is represented by Foundation Behram Bakhtiar in France, Artscoops in Lebanon, Brave Art Consulting in Santa Fe and Art Represent, Emergeast, and Ideal Art in London UK. I am interested in the crossing point of the unconscious, the personal and the collective, and energies that come to surface from the interplay of primordial contradictory forces—those within and without—on the surface of the painting. I approach painting as the visual evidence of, and not a report on, an experience; not a representation of spiritual energy but a translation of it into light and texture, navigating the space between stasis and movement, between emergence and disappearance. I often start with calligraphic gestural marks, solid forms which then dissolve as the layers explode and implode, are added, rubbed out, re—applied, scoured into and scraped away. Going back and forth until another dimension—a sense of resonance— arises, when the whole becomes greater than the sum of its parts, where forms and marks become metaphors for a transcendent reality. I strive to connect to a greater energy by using the energy of the gravity of the earth to push and move paint until the distinctions between the foreground and the background and the spatial hierarchy melt away and disappear and the ephemeral begins to emerge. My art is an archiving process having to do with psychic geology and, somewhat akin to layers of memory – giving way to another, ephemeral sense of form and visual phenomena, dealing with an interior as opposed to an exterior reality. I see abstraction as representational insofar as it is a representation of a psychic state, not an external reality. The trajectories in contemporary painting in which my work belongs range from Abstract Expressionism in the west to Persian and Taoist/Zen aesthetic sensibilities in the east and other perennial visionary paths of wisdom.